For unto you it is given in the behalf of Christ, not only to believe on him, but also to suffer for his sake; Having the same conflict which ye saw in me, and now hear to be in me. Storms will come to those who have built their lives upon God's Word as well as those who have not. The foundation of a man's life is what will determine the outcome of the storm. Now this does not mean that you make yourself suffer believing it would be pleasing to God. God is never pleased when people suffer. To purposefully make yourself suffer (an act called asceticism) is a sin. Many people try to do this to try to appease God's anger or make themselves appear holy or religious before men. But the appeasement of God came through the blood of Jesus Christ. 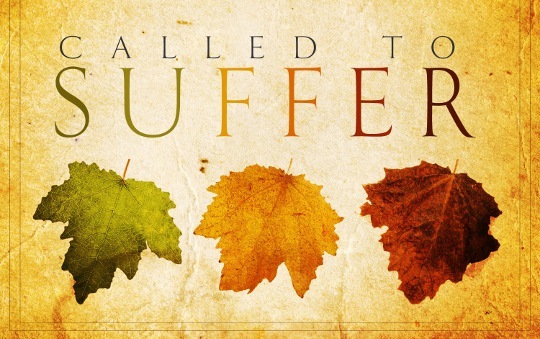 God does, however, take the tragedy of suffering when it does touch your life and redeem it for good. Jesus called believers to a life of denial, suffering, and the cross because of the powerful potential of the fellowship of His suffering. Resurrection power and the power of His suffering are like the positive and negative forces of electricity used in modern societies. It takes both the positive and negative to create power. Out of our suffering, we emerge stronger, wiser, more dedicated, more determined to be all that God would have us to be as well as all that He would have us do as we realize that we are being directed to our true purpose in God! Praise the Lord! This is beautiful, I so love how you gathered all the verses (the powerful word) then broke it all down to in depth of understanding. I agree, as Christians we will suffer as you've pointed it all out in the word which says it all. Glad you pointed out how the Lord has a master plan when it comes to sufferings and strife, etc., that he will turn it all somehow into our good and valuable lessons and tests of faith and strength. Times like these are the times we begin to realize just how strong or weak in Christ we really are...In troubled times, we'll just have to hold on, trust, have faith and believe in his word which never fails. Everything you've pointed out, is so on point, praise the holy name of Jesus! Thanks and I thank God for you and your spirit to serve and deliver, in the precious name of Jesus. I am honored and humbly serve God in the sharing of His word to encourage and uplift others in Jesus name! Thank you so much for making my effort feel worthwhile!